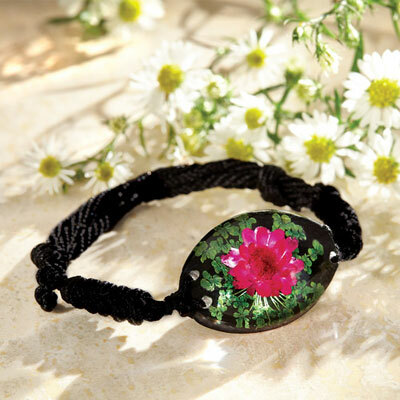 This Everlasting Flower Bracelet is a natural beauty! A little, pink flower and leaves of clover are preserved in clear resin, held on a knotted, black cord band. 1¼"l bauble on sliding adjustable cord. Imported. One size fits most. Hurry! Quantities are limited! On sale for $2.99, this bracelet is a great value. It has a real red flower inside with green leaves and has adjustable black cords forming the bracelet. The center part is 1 1/4 inches wide x 7/8 inches side to side and is in polished acrylic. It comes in a very nice little gift box. Don't hesitate to buy this.